Hazel Tindall was born in Shetland and is the fastest knitter in the world. Hazel is considered to be the world’s leading authority on Fair Isle knitting.Her colorwork technique is fastest because it is the most efficient and straightforward making it simple to learn. There is nothing Hazel enjoys more than helping other knitters find greater ease and joy in their work. Hazel Tindall grew up in rural Scotland where knitters had to knit quickly and accurately to produce garments of high quality in order to gain an income. Hazel Tindall comes from three generations of knitters including her grandmother, mother, aunt and older sister. One of Hazel’s earliest memories is being sent outside to check if she could see her 80 year old grandmother making her way down the hillside carrying a basket of peat on her back and knitting as she walked. Hazel has no memory of learning to knit and with over 50 years of production knitting she’s knit hundreds, if not thousands, of pieces of knitting. Hazel’s great love is colorwork and the art of Fair Isle. Hazel believes there are so many beautiful colors and patterns from which to choose she’ll never run of out ideas. Hazel Tindall is a well-known knitting expert hailing from the isle of Shetland off the coast of Scotland near Faroe and Norway. In 2004 and again in 2008 she gained the title and defended the title of "World's Fastest Knitter." Hazel is the star of the popular knitting instructional course "the Fine Art of Fair Isle Knitting" where she teaches her easy and efficient knitting technique for knitting a seamless Fair Isle cardigan (Shetland Star) from start to finish. Hazel enjoys teaching others to knit and to help them improve their skills. When asked what she enjoys most about teaching Hazel replied "I enjoy being able to make people's lives easier by spotting their problems and telling them how to fix them – like when I see someone knitting with the yarn wrapped around their fingers the wrong way, for example." Featured in Derek Reay’s book "Significant Figures in Art and Craft Today”, Hazel Tindall is definitely a significant figure in the knitting world today. Three pieces of Hazel’s writing about knitting memories were selected for inclusion in the book "Real Shetland Yarns" (published by Shetland Heritage Publications in 2012). Hazel helped edit the book, "Slyde in the Right Direction" by Chrissie Sandison, which was published in 2008 by The Shetland Times Ltd. The book was based on Hazel's mother's memories of life in Shetland in the 1920s, 1930s and 1940s and the royalties were used to support a charity. Hazel also was a contributor to "Shetland Textiles: 800 BC to the Present", published in 2013 by Shetland Heritage Publications. 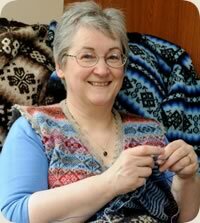 Hazel is a current member of Shetland Guild of Spinners, Knitters, Dyers and Weavers. In April 2013 Hazel was invited to apply to be included in UK Hand Knitting Association's Register of Knitting Artists and was delighted her application was accepted.